Pinarius Natta was one of the moneyers for the year 149 BC. He is not otherwise known, but could be a brother of the moneyer for 155 BC witht the same name. Gens Pinaria was one of the most ancient patrician families at Rome. According to tradition, the gens originated long before the founding of the city. The Pinarii are mentioned under the kings, and members of this gens attained the highest offices of the Roman state soon after the establishment of the Republic, beginning with Publius Pinarius Mamercinus Rufus, consul in 489 BC. 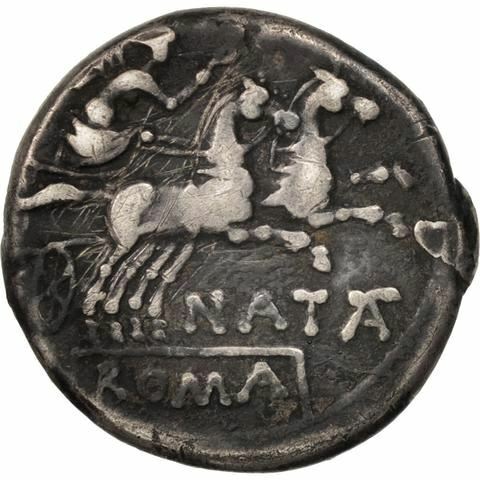 Natta or Nacca, referring to a fuller, was the surname of an old and noble family of the Pinarii, which flourished from the fourth century BC into imperial times. Cicero mentions the family, and an ancient bronze statue of one of its members, which was struck by lightning in 65 BC.